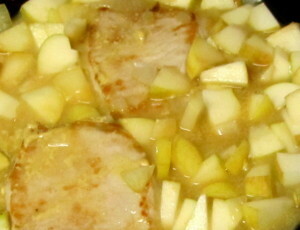 Yes, I just wrote about baking loin pork chops… but now I’m braising pork chops with apples! 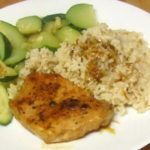 The trick with pork chops is keeping them moist and tender. You absolutely can pan fry them, or cook them with a grill, but while that is fast, and can be quite tasty, it’s usually a bit… shall we say, chewy? But braising them with just a little liquid, over a low heat, gives moist, tender, succulent meat. It has the further advantage that you can vary the liquid to give you different flavors. And this works well with meat still on the bone, as well. The recipe really started with a consideration of flavor. I had chops, and I needed dinner, but I also needed something to post about. 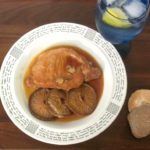 I’d originally thought of my basic fallback – a little chicken broth and some sage – but that sounded too much like the chicken I wrote about recently… (The flavor is actually different – pork and chicken are, of course – but it still felt repetitive.) I was remembering a recipe I sometimes make using orange juice and spices, but I didn’t have any orange juice. 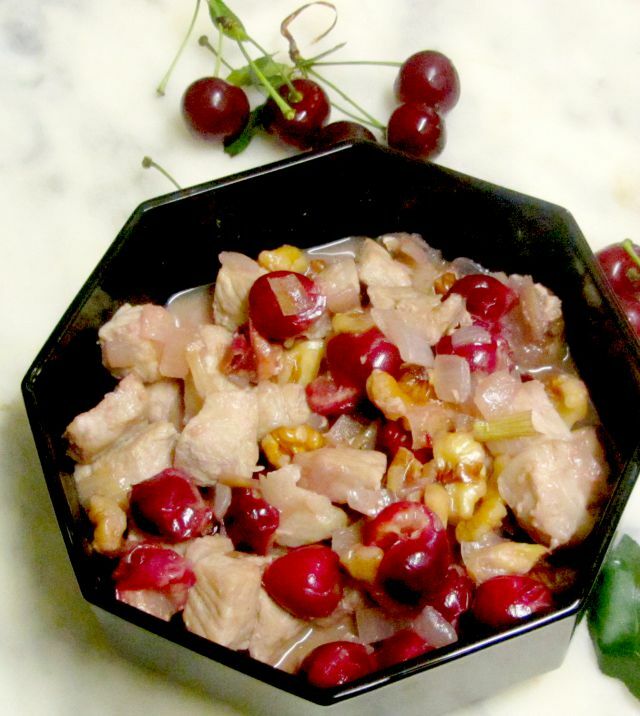 I have apples, though, which are wonderful with pork! So, I took 2 boneless loin chops, and trimmed the heavy fat from the side. Heated a skillet, added a touch of oil, browned the chops, and then set them aside. While they were browning, I chopped a small onion. 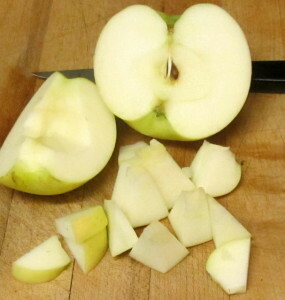 Then I cored and chopped an apple. I didn’t peel it because I’m lazy the apple peel is attractive (though it would be even prettier if it was redder… this happened not to be.) It cooks soft enough that the texture was no problem for us – feel free to peel if that makes more sense for your family. I wanted some seasoning with it, too. Mustard is wonderful both with pork and with apples or other fruit… I really would have preferred a sharp grainy mustard in this dish, but what we happened to have on hand was a lighter, creamier (somewhat blander…) Dijon Style. It still worked. I started to saute the onion in the pan. When it softened, I added the apple, and stirred it. 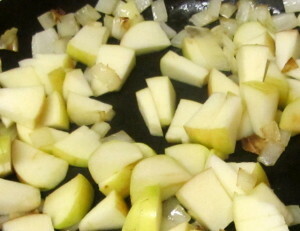 When the fruit also started to soften a little, and the onion began to turn golden, I returned the chops to the pan. I brought the mixture to a simmer, covered it, and simmered gently for 20 minutes. Then I turned the chops, and cooked 10 minutes longer – you might want up to another 20 if they are thicker. 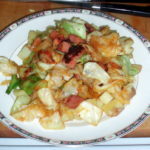 When they were fully cooked, I removed them to a plate, and tasted the mixture in the pan – this is the time to add more mustard, if you feel it needs it. This was a little mild to our taste, but I decided to leave it as it was. 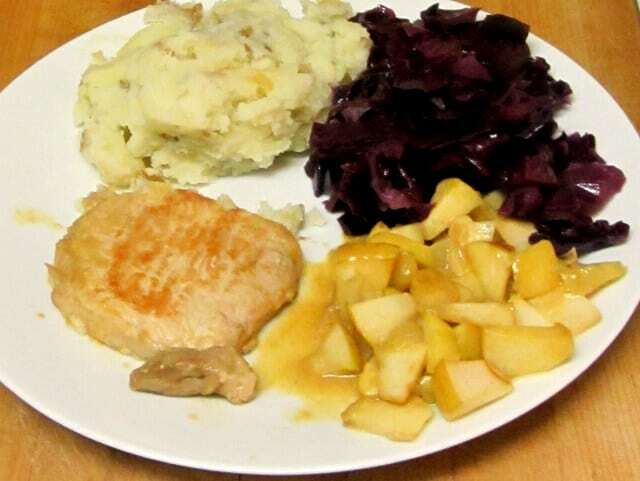 I decided to serve the apples on the side, as a condiment, but I could have poured them over the meat or potatoes – however you like. I served these with mashed potatoes and red cabbage I’d cooked previously – it was a lovely combination. 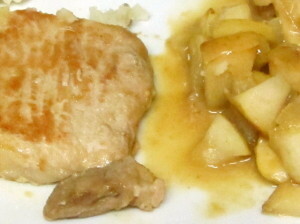 Essentially, a very basic braised pork chop – the only complication added is a chopped apple. That simple change gives an entirely different flavor. 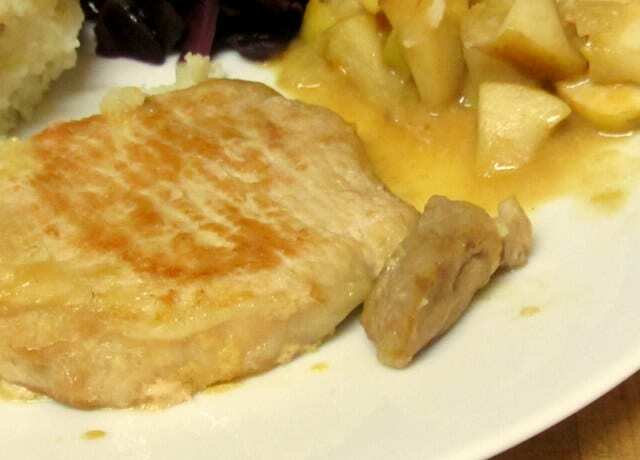 Sweet and spicy pork chops braised with apples and mustard - an easy variation of a basic recipe, and a warming winter meal! 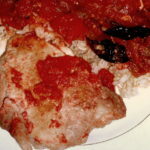 Heat oil in a frying pan, and brown chops. Remove from pan and reserve. 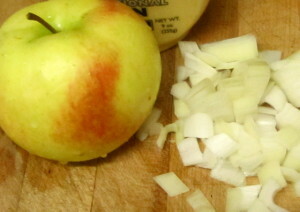 Saute onion, add apple after a few minutes. Saute both until soft, and until the onion starts to color. Return the chops to the pan. Add broth, and 1 T mustard. Cover. Simmer over a low heat 20 minutes. Turn the chops, simmer another 10-15 minutes until done. Taste the apples for seasoning, add more mustard if needed.